Sweet Potatoes or Yams for the Holidays? Both are Yummy! times. Yams (Dioscorea alata L.) are from West Africa and have been cultivated for about 50,000 years. 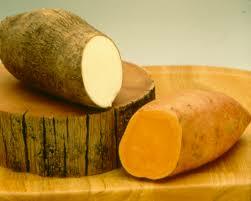 label &quot;yam&quot; always be accompanied by “sweet potato”, however there is a difference between the two. potato. The Southern type is moist-fleshed, syrupy and sugary. County and one in Fannin County. I know it’s a little early, but Happy Thanksgiving!